Shteelim explored Bamidbar as the place between our old home and our new home. Early in the theme, children built their ideas about hom e and traveling using wooden blocks. Later, when they had more ideas about the Israelites’ experience, Shteelim used permanent markers to create a transparent copy of a picture of their building structures. Children imagined what new ideas they could add to their building, and drew them on transparent sheets. Lastly, Shteelim used permanent markers, and designed stickers to layer their new and expanded ideas about Bamidbar into a final Sci Fi-esque landscape rich with personal feelings, imaginings, and self-reflection about Bamidbar. Nitzanim’s Bamidbar journey was about finding our voices. 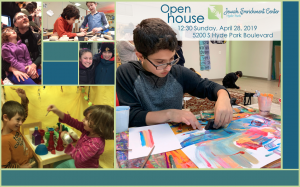 In the six weeks that children wrestled with the Israelites’ journey, children gained a new confidence in adding their voice – their words, ideas, and questions – to our community’s conversation. They also found a way a to give a voice to the characters in our texts through their yetzirah (art/creativity) final projects. 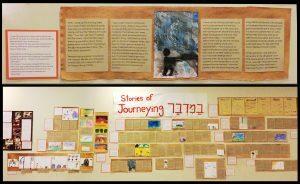 Nitzanim created personalized travel journals using oil pastels, collage, watercolor crayons, and permanent markers to make multiple entries from their own perspective of the Israelites’ Bamidbar journey. 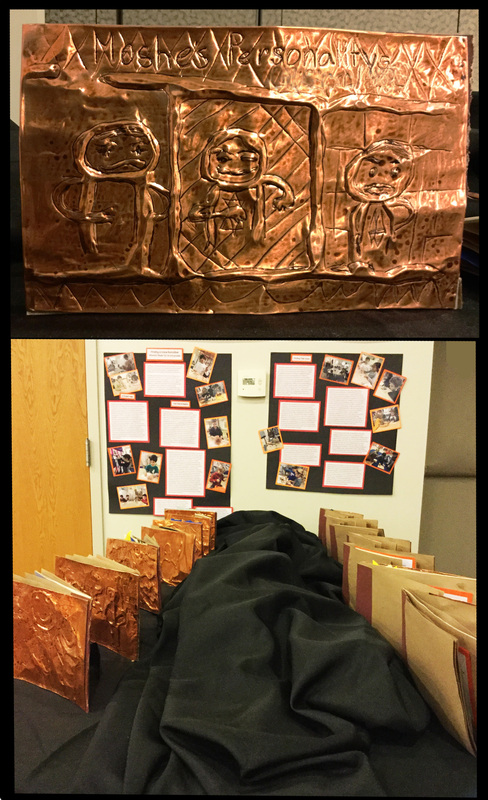 The bronze embossed cover of the travel journal shows a symbol of a child’s big idea that shows up again and again in their entries. written journal of the Israelites’ journey through the midbar (wilderness), through the eyes of characters they created. They used their characters’ positions within the story to ask and explore the questions that were most compelling to them. Some children focused on the vulnerability, danger, and excitement of a journey through the wilderness, transposing the stories from the Torah into a futuristic, outer space landscape. Some children explored social and emotional dimensions of the journey, leaving the only ‘home’ they had known and imagining the excitement and uncertainty about a new, unseen destination. 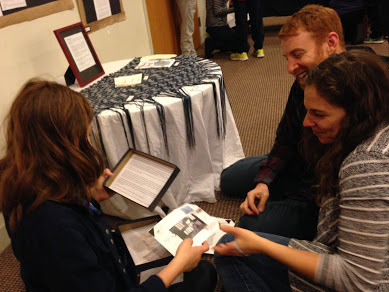 Some children used this project as an opportunity to wrestle with their questions about God and the Torah itself, placing their characters in tension with the divine instruction to build a mishkan, and imagining the social and personal experience that might result from standing apart from what they perceived as the communal norm. 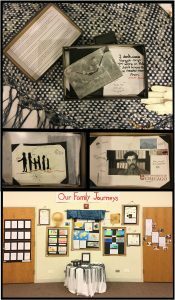 Each child’s work represented the development of their own particular questions and voices. What is home? Is home a physical place? Familiar sounds and smells? My family? Memories? What happens to my sense of home when I must leave on a journey to establish a new home? In fifth and sixth grade, Alonim (“Oak Trees”), we explored ideas of home, leaving, and journeying through the perspective of the Israelites in the Torah and through our own family stories. One sixth grader traced four generations of her family from Poland through Canada to Chicago. She designed different types of postcards for pivotal events in her family’s story, and placed them in a box designed to be opened and shared, again and again. View a picture here.